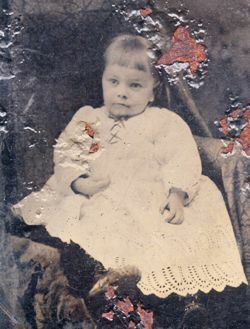 These are some of the oldest and most damaged of the Fagan family photographs - some from moisture and rust, some from 100+ years of real life. 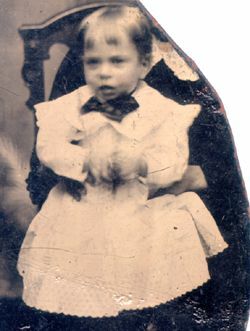 Because they were among Anna Fenton's possessions, they are most likely images of her siblings. Fortunately, the faces of most subjects are clear. In those that are obscured, there is still enough information to characterize, if not identify people. Unidentified tintypes. The image on the prior page was the only one identified as Anna. It was most likely taken by a Manhattan photographer around 1884. These tintypes were	among the same batch. Only two tintypes were identified: one of Anna and one of her sister Mary. 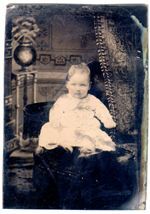 Because there are four images of infants in this group and Anna had two other siblings who lived over 13 months, my best guess is that the two unidentified infants are her brothers Thomas and Edward J. 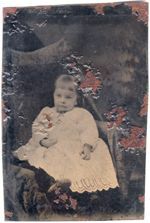 Unidentified tintype of a 1 year old(?) 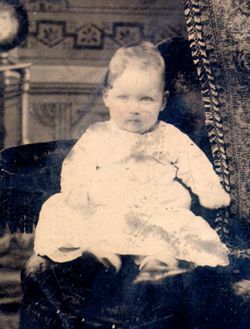 child, possibly Thomas, Edward or Anna Fagan. If Anna, this was 1883, if Thomas, 1885, and if Edward J., 1887. Matthew and Margaret Fagan also lost two children in infancy. It is conceivable that the photo shows one of these two. 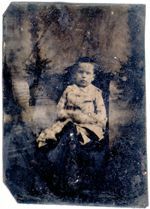 Unidentified tintype of a (roughly) 2 year old child, possibly Thomas, Edward or Anna Fagan. As you can see in the full frame picture, a female adult's form was physically removed by a cut in the tin. If Anna, this was 1884, if Thomas, 1886, and if Edward, 1888. 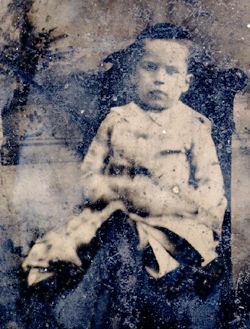 Another unmarked tintype, but the subject is old enough to be clearly identified as a boy of about six, and looking very much like Thomas Fagan. That would date this to about 1890-92 and possibly taken in Long Island City. It's heavily ingrained with dirt and handprints that have adhered to a varnish coating. The coating probably saved it from the moisture that damaged Anna's and Mary's tintypes, but has caused a problem of its own. Mary Fagan's name was taped on the back of this tintype. Like Anna's (above left), it is moisture damaged, with the back rusted and the film emulsion bubbling and cracking off. This tintype is extemely fragile, but the content is (happily) visible. This is not a tintype, and it's unlikely that it shows one of Anna's siblings, but I'm including it because it may be the earliest family photograph in the Fagan lot - and it is probably a cousin.